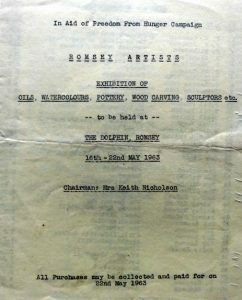 The catalyst for the formation of the Romsey Art Group was a Freedom from Hunger campaign in May 1963. Local artists came together to stage an exhibition at the Dolphin Hotel (the present-day Bradbeer’s department store) in the heart of Romsey. 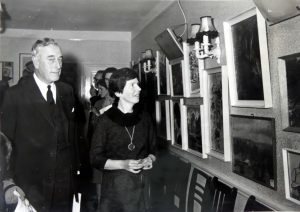 Lord Mountbatten is seen with organiser, Mrs. Patience Nicholson viewing the fund raising exhibition. 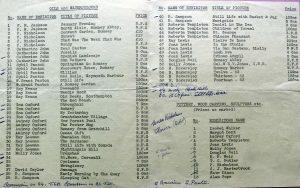 The success of the venture spurred the artists to create a formal group which was inaugurated on June 14th 1963 and Lord Mountbatten and Patience Nicholson became Romsey Art Group’s first president and chairman respectively.